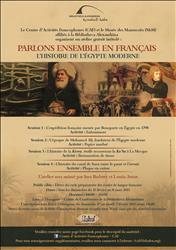 The BA Francophone Activities Center, in cooperation with the Manuscript Museum, is organizing a workshop titled “Let’s Speak French Together: The History of Modern Egypt”. The workshop will be held every Sunday at the BACC Hexagon from 10:00 am–3:00 pm, starting from Sunday, 15 February 2015. The workshop will last until Sunday, 8 March 2015. The workshops target francophone preparatory school students and comprise several lectures about different topics, such as Bonaparte’s French Expedition to Egypt in 1798; the age of Mohamed Ali, the founder of Modern Egypt; the history of the Suez Canal: past and the future; and the history of kiswet al-Kaa’ba. Each lecture will also include interesting activities for children. The workshop will be presented by Ines Badawy and Lamia Antar. To register for this workshop, please fill out the application and present it, along with the required materials listed in the application, at the BACC Hexagone during 1–3 February 2015 before 2:00 pm.